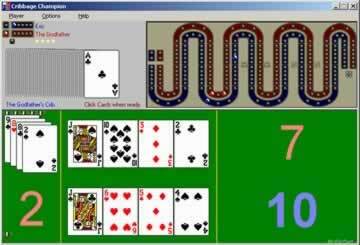 Cribbage Champion Game - Download and Play Free Version! Play Exciting Cribbage Matches and Become a Champion! Cribbage is a fun game. Like most card games, it may involve a fair amount of luck to win, but it also has many deeper levels of strategy. It’s fast-paced, but can last for a good number of rounds. More than anything else, it’s also incredibly simple at its base.Unfortunately, it also requires at least one other friend to enjoy, meaning you may not always get to play it when you’d like. Luckily, you can always turn to your computer for help. Cribbage Champion is here to provide! Do you like to add a little spice to your card games? 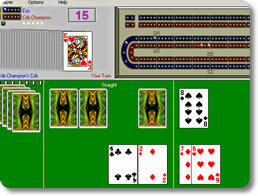 Cribbage Champion has the options that let you decide how your game will look. Choose from dozens of differently-themed card decks. Keep score on four distinct cribbage scoreboards. Enable or disable the dynamic Score Keeper as you see fit. Make up the names for your computer opponents. Enhance your game with different sets of music and sound effects. Get more off the web! As it is, cribbage is already an incredibly addictive game. However, Cribbage Champion ups the ante in more ways than one. Dynamic artificial intelligence. Watch as your opponents get better over time the more you play against them. Unlock a variety of trophies and achievements. Set your rules and preferences. Allow for re-deals, put in the odds for a computer miscount, and more! Playing cribbage can be all well and good, as is honing your skills in it, but knowing exactly how much you’re improving can be kind of tricky. If you’re the kind of guy who needs to objectively quantify your skill level, then rest assured that Cribbage Champion provides a myriad of statistics to help you analyze your progress. Watch the detailed Score Keeper update points for every card played in real time. Records a wide variety of player statistics, including wins, losses, skunks, best hands, best cribs and more! Compare your statistics with those of the AI players and see which ones are the most formidable. Create different profiles that save different sets of statistics. Cribbage is a game that everyone can enjoy. It’s easy to learn but hard to master. 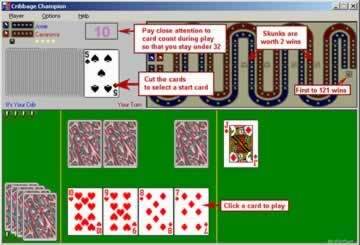 Cribbage Champion makes both possible by providing ruthlessly intelligent AI that gets better over time, endless statistical data, and a myriad of options that allow you to optimize your card-playing experience. Get it and prove that you’re the one true champion of cribbage!